The Mars Science Laboratory, or Curiosity, is set to launch between November 25 and December 18, 2011. Its primary mission is to determine whether Mars is, or ever was, habitable. Curiosity will examine soil and rock samples to determine whether there is any sign of past or present microbial life. It will also try to determine the past and present extent of water on Mars. Curiosity is five times larger than any other rover sent to Mars. The new rover weighs 600 kg (2000 lbs) and carries more than ten times the amount of scientific equipment of previous rovers. Curiosity is set to land on Mars between August 6 and August 20, 2012 and has an expected operation time of 668 Martian sols (686 Earth Days). The landing site for the rover was announced on July 21, 2011 as Gale Crater. Michael Meyer, lead scientist for NASA's Mars Exploration Program claims that Gale Crater was chosen because "the site holds a diversity of features and layers for investigating changing environmental conditions, some of which could inform a broader understanding of habitability on ancient Mars." He also states that "Gale gives us attractive possibilities for finding organics," but points out that that it is still unlikely we will find organic life still living on Mars. 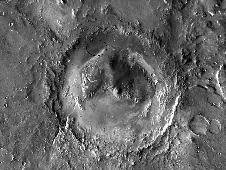 Gale Crater is 150 kilometers (around 93.21 miles) in diameter and contains an enormous mound near the center that rises higher than even the southern rim of the crater. It rise 5.5 km above the northern crater floor and 4.5 km above the southern crater floor. The mound contains many layers; it is estimated that its foundation may be 2 billion years old. Curiosity will be able to examine these different layers and determine at which point, if any, Mars was able to support life. It is speculated that the mound is what remains of sedimentary layers that once filled the entire crater and that these were initially deposited on a lakebed. Regardless of whether Curiosity discovers past or present life on Mars it is a great step toward manned exploration of Mars. The discoveries that Curiosity makes will at the very least give us a better understanding of the Martian past and its habitability. Knowing this will enable us to plan for future missions to Mars. very informative, I always get nervous about these missions, it is a very big initiative. Great article! I'm excited about this mission and will be following developments closely. I too am excited and look forward to following and writing about the developments as they come!